The cozy hamlet of Pleasant Hill, nestled in the perpetually balmy hills of Contra Costa County, east of the San Francisco Bay Area, was incorporated in 1961, but didn’t have a true downtown or Main Street until thirty years later. It has a population of 33,152 (2010 census). Though its development was relaxed, the town has an impressive architectural heritage, including an architecture-award-winning city hall and the iconic Century 21 Theaters’ “Dome” theater designed by the Bay Area architect Vincent G. Raney (demolished April 2013). The theater’s 50-foot ceiling and igloo-shaped design was created to showcase the Cinerama widescreen process, which had been developed in the 1950’s. Thinking ahead of the environmental curve, Pleasant Hill authorized a study of hillside development in the 1980s that included detailed mapping of biota, geotechnical hazards, sound levels and other environmental constraints. And the city continues its tradition of environmental-consciousness today. Pleasant Hill contracts municipal solid waste collection, processing, and disposal services to Allied Waste. Certain objects cannot be left for weekly garbage or recycling pick-up, such as electrical appliances, mattresses and other furniture, hazardous waste, construction debris, and E-Waste. E-Waste includes: computer monitors, televisions and other electronic equipment should NOT be disposed of with garbage, recycling, or organics. The city recommends that working E-Waste be sold or donated and that non-working E-Waste be taken to the monthly E-Waste event. We offer our hauling and junk removal services to Pleasant Hill and the entire San Francisco Bay Area! Not sure if we serve your area? Check out all of our Areas of service. The easiest way to hire the number 1 Pleasant Hill junk removal company is to schedule an appointment online. 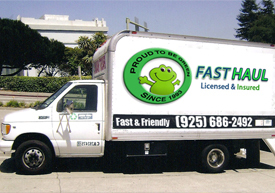 In fact, not only it is easy, but a Fast Haul representative will come out to your job site to do a free estimate.